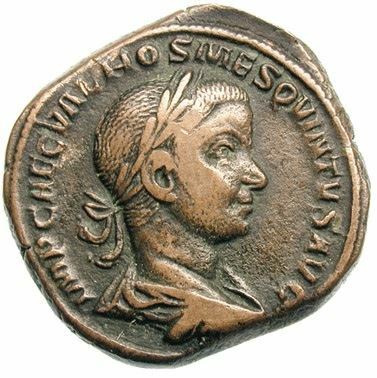 Gaius Valens Hostilianus Messius Quintus Augustus was Roman emperor in 251. He was born in Sirmium sometime after 230, as the son of the future emperor Decius by his wife Herennia Etruscilla. He was the younger brother of emperor Herennius Etruscus. Following his father's accession to the throne, Hostilian received the treatment of an imperial prince, but was always kept in the shade of his brother Herennius, who enjoyed the privileges of being older and heir. In the beginning of 251, Decius elevated his son Herennius to co-emperor and Hostilian succeeded him in the title of princeps iuventutis (prince of youth). Following the death of his father and brother, he was adopted by Trebonianus Gallus and made co-emperor, but died soon after from the plague.